Have you ever hung around someone who likes a food that you don't particularly like, and somehow over time you gradually get converted and end up a big fan of the food? This is what happened to me and passionfruit. I never hated the stuff, but I just didn't particularly enjoy eating it, especially the crunchy seeds. But Sir D loved passionfruit and he absolutely couldn't get enough of the stuff. He'd buy it when it was cheap at the supermarket and we'd end up getting passionfruit gelato whenever we went to eat ice cream. And he converted me - I don't know how it happened but I've developed a love for passionfruit, and now I'm the one who insists on getting passionfruit gelato when we go out. 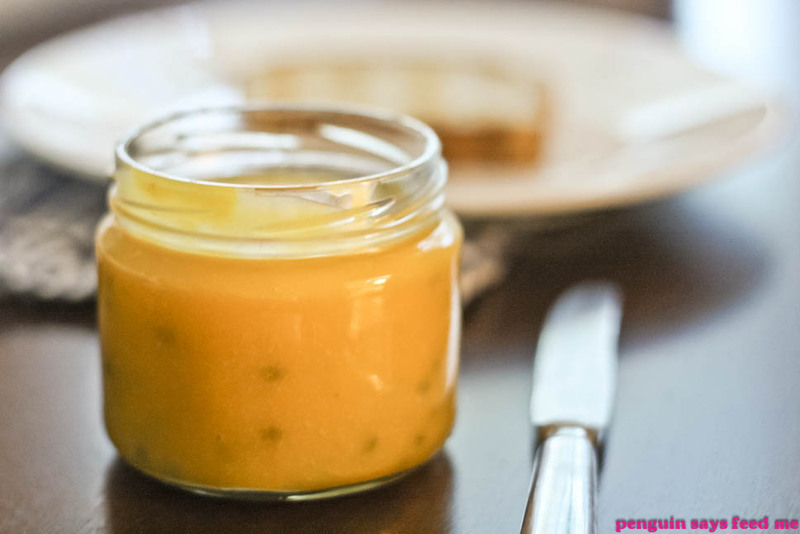 I first came across passionfruit butter at my school's Garden Party (read: posh term for school fete) where they sold it at the Jams and Preserves stall. 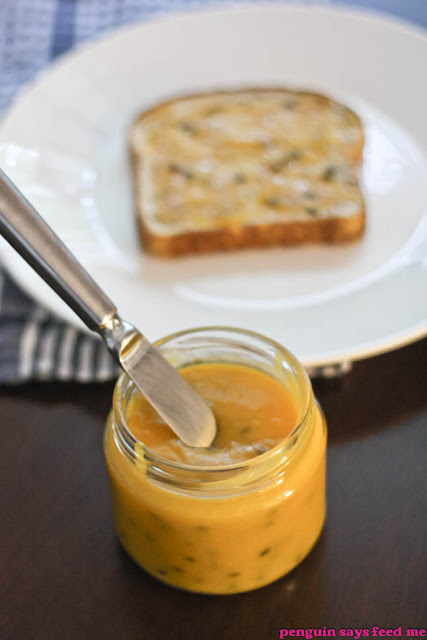 I bought a jar home for Sir D and while we spread the liquid gold dotted with black seeds on toast and savoured the sweet passionfruit flavour, I thought, why can't I make this myself? So I did. The next time I saw passionfruit on special at the grocery store I grabbed six of them and set about making my own passionfruit butter. 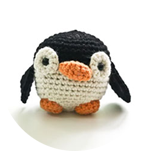 I was surprised at how easy and simple it was to make and wondered about all the things I could use it in. You could smother some between cakes, put it in tart cases or sandwich it between macaron shells (yes that's macaron, not macarOOn!). But my favourite way of eating it is just spread simply on a slice of toast for breakfast in the morning. Mmmm yes, tastes like sunshine. 1. In a saucepan, melt the butter and sugar over medium heat. Stir to dissolve the sugar. 2. 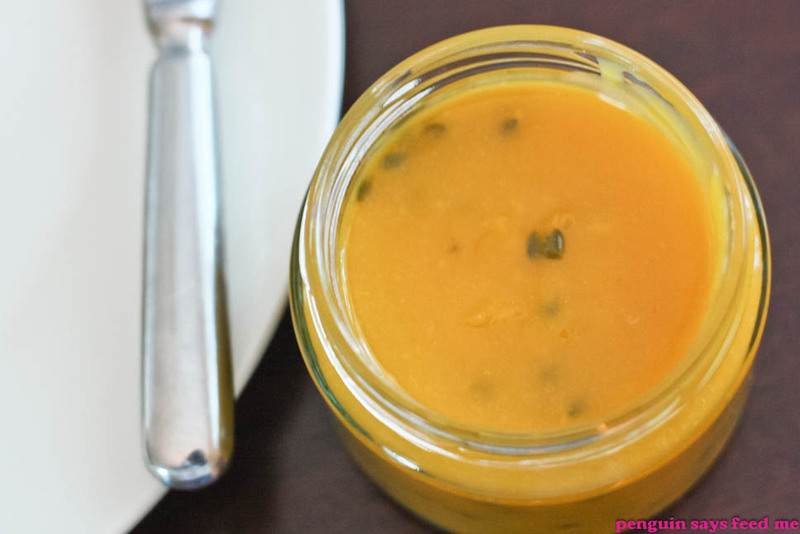 Reduce the heat to low, and add passionfruit pulp and egg, whisking constantly until thickened. Add some lemon juice if it is too sweet for your liking. If you don't like the passionfruit seeds, you can strain the mixture through a sieve to remove them. 3. 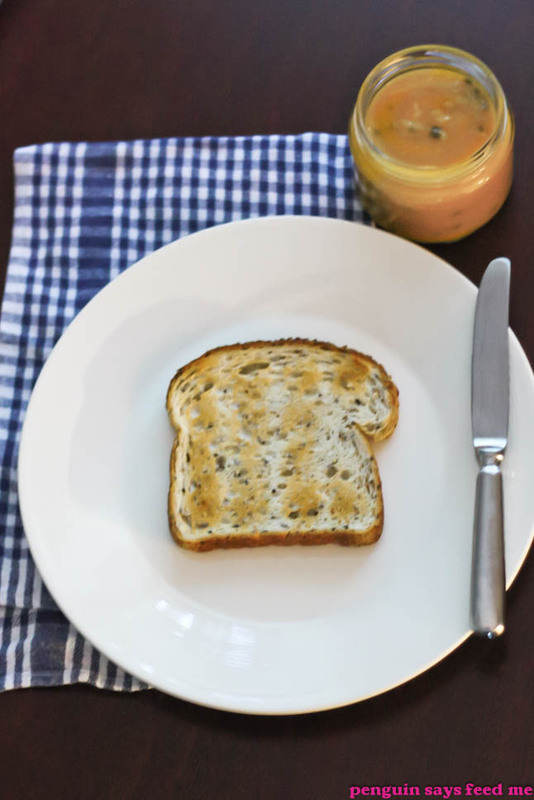 Pour into a sterilised jar* and store in the refrigerator for up to two weeks. Makes about 400mL. *You can sterilise jars by boiling the jar and the lid in water for 10 minutes, then drain them by placing them upside down on a clean tea towel. Dry the jars thoroughly in the oven set to 150ºC. Oh my... yummy! Looks so thick and sweet. I must admit, I buy this rather than make it myself but I think you've converted me to the homemade stuff! Yum I love passionfruit and the butter is just so delicious! I used to not like many things when I was younger, but now I can't think of anything I couldn't eat! Liquid gold! 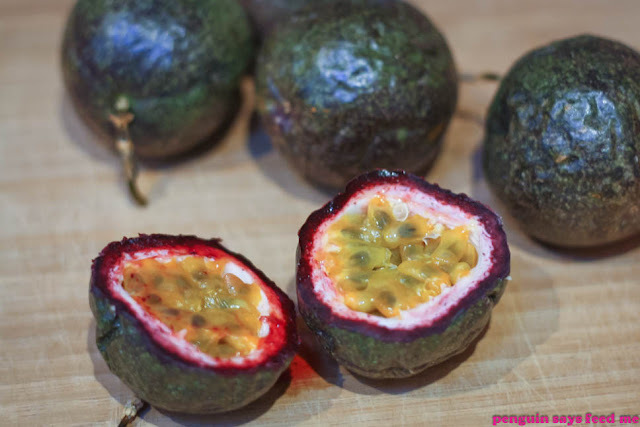 I've always loved passionfruit and this is such a great way of eating it! Husband converted me to many sashimi-style foods =) As for passionfruit, I love it anyway and how convenient that the yolks can go in this butter and the whites can be used for macaron shells. Win! 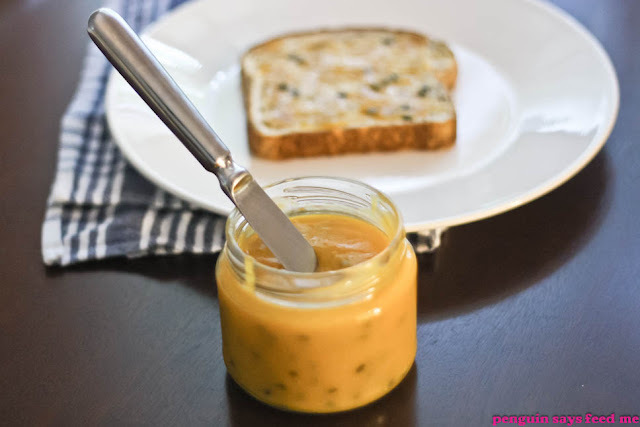 yum yum i love passionfruit butter. I agree - it is like sunshine in a jar! I agree, Passion fruit does taste like sunshine! I just did a post on passion fruit bars that you might enjoy. Have a great day! Ahhh that looks so good! I actually ooohed when I saw the title of the post, it sounds (and looks) heavenly! I might have to try putting it in a macaron now! Oohh I haven't tried passionfruit butter but I was addicted to lemon butter a few years back mmmm have not had in agges! I love the smell of passionfruit but don't particularly enjoy the taste nor the seeds. Perhaps your passionfruit butter will convert me? It looks great! 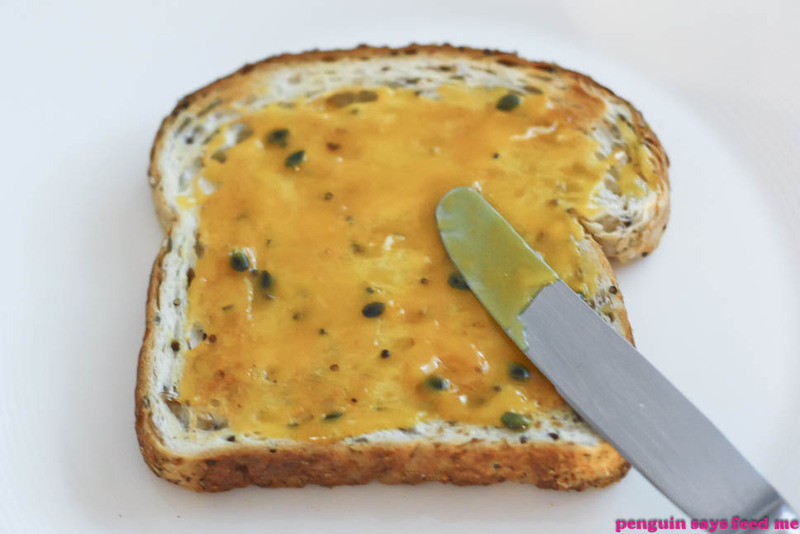 I love passionfruit, but I think I'd love passionfruit butter even more! Wow! I absolutely love passionfruit jam but haven't made it at home. Will try soon. I grow passionfruits and have quite a supply at the moment - So I may have to turn them into passionfruit butter! Hi chocolatesuze - Hehe I used to have issues with the seeds but now I sort of like the crunchiness, it's strange! Hi Maria - I'm sure we were all picky eaters when we were younger, although there are a few things that I still don't like even now! Hi mademoiselle délicieuse - Haha right now I'm loving any egg-yolk recipes since I have leftovers from my macarons... and this one is perfect since it can fill the macarons too! Hi Thang - It's like the sweeter version of passionfruit! Hi The Ninja - hoho yes GARDEN PARTY. And macarOOns, you say? Hi Ellie - Ooh passionfruit jam, is that the same thing? Sounds delicious!